Published by frgee on Monday, June 30, 2003 at 7:51 PM. good news and bad news - first the good news: the staff here at blog central joyously announces "radio free banica", the new commenting system. the one new feature, other than stability, is that you can now comment on others' comments. the bad news: all the old comments have passed on to the great digital graveyard. i guess i could resurrect them, but it would be a massive undertaking. so, if you have written anything you want people to read, please re-post. sorry about that. Published by frgee on at 1:34 PM. wonder of wonders, the comments have reappeared, but apparently the fix is a temporary one. therefore, i have begun a quest for a different comment service. the last few days of commentless blogging has been a drag. the blog is a vacuum without the surly, sarcastic, banal, intelligent, insightful, and inspiring reflections of the hoi polloi. i hope to have the situation remedied by late tonight. Published by frgee on Sunday, June 29, 2003 at 5:19 PM. well, as you can see, even if you are color blind, the layout of the blog has changed dramatically. for some reason i wearied of the old one, so i decided to make some alterations. if the comments ever come back on, let me know what you think of it. i have tremendous news: i have, through the grace of God, on this feast day of Saints Peter and Paul, acquired a charcoal grill. the haitians make great charcoal, so i bought a huge bag and plan on grilling up some corn, yucca, and hot dogs tonight after dinner. a little ketchup, mayo, and hot sauce ought to make for some seriously fine dining. i only have one bag of gibbles hot potatoe chips left, but i've been saving them for an occasion such as this. i will wash it all down with a little presidente. pray for this country - the whole country is going on strike tomorrow for one day - evidently they are mad about something and will spend the day rioting and causing general mayhem. Published by frgee on Saturday, June 28, 2003 at 11:53 AM. Published by frgee on Friday, June 27, 2003 at 10:14 PM. Published by frgee on Thursday, June 26, 2003 at 5:21 PM. 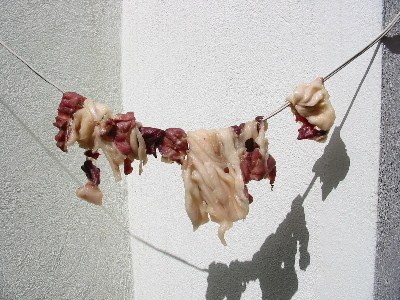 it will hang there in the sun all day and then she fries it up with some yuca!!!!!!!! Published by frgee on Wednesday, June 25, 2003 at 7:27 PM. Published by frgee on Tuesday, June 24, 2003 at 5:32 PM. it's raining - praise the Lord. perhaps it's the intercession of St. John the Baptist. happy solemnity. right here is a picture of my office, taken from the bathroom...don't you dig the goat hide covered chair? Published by frgee on Monday, June 23, 2003 at 9:04 PM. Published by frgee on Saturday, June 21, 2003 at 6:35 PM. upon entering the cave, one is filled with two main senses: sight and smell - the eyes see an unique beauty, the nose, well, let's just say it smells something unique - notice the bats in the first photo - they live, eat, and do everything else in the cave...i bet the cave holds about 400-500 people - the shot from the altar gives a perspective of size. also note that the picture taken of the icon was taken in absolute darkness. we couldn't see anything, we were just crawling through this small side cave with a small flashlight and i took a picture and the icon showed up, never did see the thing in the light. i'll fill you all in on the actual patronal feastday goings on in october...the photos are here. Published by frgee on Friday, June 20, 2003 at 3:15 PM. this morning i was introduced to an interesting facet of domincan life: i went to the bank in elias pina (about 45 minutes away on the haitian border) to get the bank accounts straightened out so i can sign checks...) and afterwards decided i needed to buy some boots for riding the moto. so, three young men from the parish and i ventured deep into the haitian/dominican market. this is no small market - it covers about 10 blocks - all of which is covered by tarps, some 8 feet high, others 6 feet high, still others only 4.5 feet high. i had sent the boys looking for boots while i was in the bank so we didn't have to scour the entire market, but to no avail, for there is no real order under the make-shift tent city. you can buy just about anything: cooked foods, dry food, rice, beans, lemons, beer, tobacco, cassette tapes, toothpaste, shoes, clothes, underwear, belts - just about anything under the sun. so there we were, looking through piles of boots and shoes and finally we found some that looked good. i tried them on, no good - too big. so we sloughed our way through some more and kept looking. i realized at one point that the boots all seemed to be slightly used. the soles appeared new, but the insides appeared somewhat worn. it took me a few minutes to come to grips with the fact that i was trying on used boots from haiti, but i finally got over it and picked a pair - the guy saw a gringo and asked for 350 pesos (about 12 bucks). i called him a thief. he shrugged and i said, "let's go." we moped around some more, by this time we were all hot and hungry, and couldn't find any more. so, i said to myself, "what the heck, 12 bucks is nothing" and we went back. this time i took the initiative and told him i only had 250 pesos - take it or leave it. he took it, complaining that i was making him a pauper. so, i am now the owner of a slightly used, 9 dollar pair of dominican military boots. life is good. Published by frgee on Wednesday, June 18, 2003 at 9:10 AM. a close monitoring of the poll reveals that the once front running "more audblogs" has taken a back seat to "more pictures" - stan claims it's a broadband/dial-up issue, however one woman pointed out that "chicks dig the audioblog, that's why it's winning." whatever the case may be, we will leave it for a few more days to see if "full-motion video" can make a run for the title. Published by frgee on Tuesday, June 17, 2003 at 7:08 PM. due to what some might call popular demand, and others might refer to as badgering and harassment, i have taken a load of pictures of the rectory: thus begins the visual tour. part i examines the exterior and ground floor of the rectory. please notice that the front of the rectory has a nice garden and a slew of wires running down the front. the side yard normally houses 4 trucks. the 250 gallon water tank is used to get water from the river when the water source goes down. the backyard is well shaded, and the rocks are raked regularly. the laundress, virtudes, keeps our clothes clean with a propane washer and electric dryer. the garage covers the community television as well as a couple of doves, 4 motos (of which only one currently functions), the ironing board, tools, one parrot, inverters with batteries, and the 1.5 kw generator. moving along to the kitchen, please observe the sink, propane stove and non-functional oven, toaster oven, and nearly impotent microwave oven. the dining area and pantry are self-explanatory. the five-gallon water jugs are critical for survival - we get deliveries every other week. 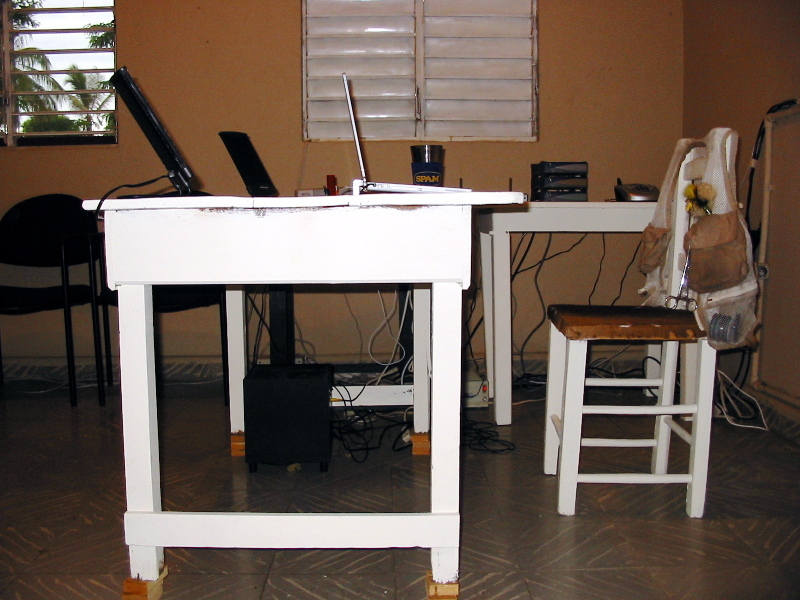 the main office houses three computers used for teaching class, the parish books, printers, copier, and secretary. the second installment of the rectory tour will include the upstairs/living area and the roof. Published by frgee on Monday, June 16, 2003 at 2:38 PM. there is a cave about five minutes from the parish, which, legend has it, depending upon whom you speak with, was the birthplace of st francis of assisi, the site of an apparition of st francis, or the home of a fransiscan priest for many years. nevertheless, the cave has become a pilgrimage site for many dominicans, and every october 4th, the feast of st. francis, thousands of people flock to the base of the small mountain and make the hike up to the cave to adore the statue of st francis and hear the bishop celebrate Mass. the climb is no small hike, about 600 vertical feet. a botanist who was visiting one day saw a rose tree and decided to do a little research on it and discovered that the rose that grows on this mountain can not be found anywhere else in the world - not even on the island itself - it has been named after st francis. the entrance to the cave is impressive, as it resides about 3/4 of the way up the face of the mountain. there is a bee hive which greets visitors on the ceiling immediately after entering. there is also a cross mounted in the ground upon which people place rocks as a sign of a particular vow or promise or resolution they might make as they enter or depart the cave. in the accompanying photo album you will also note that the picture of the face of the Blessed Mother on the rock face was not carved. according to those with whom i have spoken, it has always been there, it just appeared. a close inspection of said rock reveals no chip marks, no chisel indentations, nothing but an absolutely clean, unmarred rock. intriguing to be sure. enjoy the photos. Published by frgee on Sunday, June 15, 2003 at 9:04 AM. Published by frgee on Friday, June 13, 2003 at 9:44 PM. we have a new feature here at the mission blog: polls - off to the right you will see a poll. if you have any ideas for future polls post them in the comments section. come on, exercise your right to vote. this one is a test poll, so we'll see how it goes. Published by frgee on at 6:25 AM. Published by frgee on Thursday, June 12, 2003 at 8:01 AM. yesterday i trekked to a villagette named arroyo grande to celebrate a memorial Mass for a 34 year old man who had died. the dominicans hold to the tradition of celebrating a funeral Mass, a memorial Mass on the 9th day after, the 1 month, 6 months, and 1 year anniversaries. i arrive to find 100 people crowded around the small compound, some playing cards, others talking, others wailing. i entered the chapel and saw nothing but a dirt floor and 3 motorcycles: no chairs, no altar. i quickly found a table, told someone to get rid of the motos. after about 5 minutes someone came in and said, "we need to celebrate the Mass in the house." since the house was right next door to the chapel, and just as large, i agreed and we went next door. upon entering the house, i found about 30 people all dressed in white shirts and black pants. 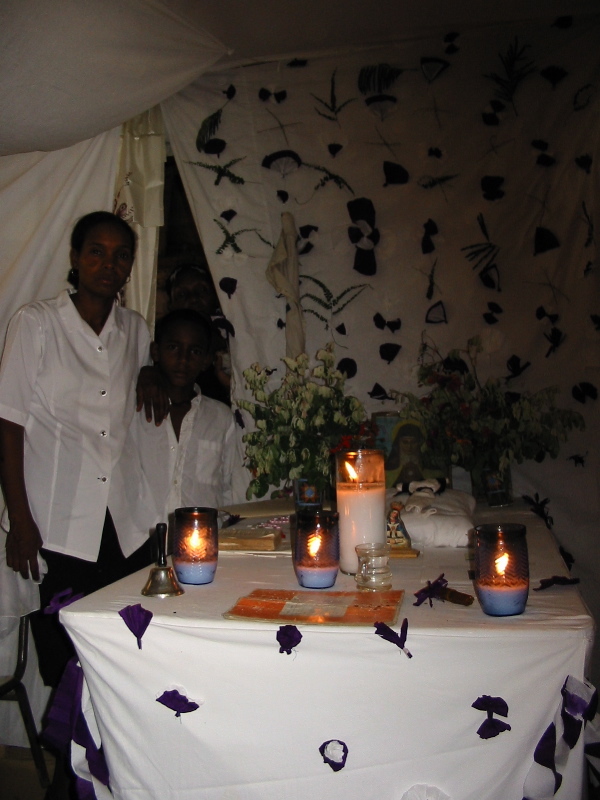 the altar was there - loaded with candles and an odd pillow with a small doll which was white with black wristbands, ankle bands, and a black scarf around the neck (picture here). the small room was packed and hot. three people indicated that they could receive Communion. i was jammed into a small corner of the room. we began Mass and i have to say, except for the buzz from the outsiders, the Mass was relatively quiet and subdued. Published by frgee on Tuesday, June 10, 2003 at 5:52 PM. resolution: purchase a high quality weather station and mount it on the roof for more accurate reporting of current conditions. Published by frgee on at 8:38 AM. composition of last night's dinner guests: 2 american priests, 1 haitian cook, 5 dominican locals, 4 brazilian nuns. languages spoken: 4, however, the attempt was made to speak spanish. menu: chicken, cabbage salad with green olives, tostones (smashed fried plantains), warm coke, beans and sugar concoction for dessert. Published by frgee on Sunday, June 08, 2003 at 9:38 PM. i want to take this opportunity to wish everyone who regularly reads this drivel a happy Pentacost...the end of another Easter season - we celebrated an exhuberant Mass this evening - i chanted the sequence, which threw off the folks a bit - and said the Roman Canon - although i was sweating like cold beer on a warm night before it was all said and done. Published by frgee on Saturday, June 07, 2003 at 7:33 PM. i used to champ at the bit at the thought dentistry in general, but after today i can't get enough of it. i also would like to add that the dental assistant has an apparently more difficult job than the dentist. dr. burns from manassas is down, and i spent about 6 hours in the dental "clinic" (i would use the word lab, but that conjures visions of cleanliness - how many dentists office have mosquitos flying around in them?). it was intriquing to sit on the "other side" of the chair for once - the dental assistant, anita, was mixing compunds, getting the shots ready, cleaning, handing off the instruments, throwing stuff away - all at the same time. i took my chance and got into the doctor's chair a few times: i am trying to convince dr burns to let me drill and yank a few teeth by the end of the week. i have determined that dentistry is a combination of tile sawing, concrete pouring, and grout cleaning...since they will be here for another 5 days and i have to sit in and translate, i will take some pictures of the set-up...time to go eat the freshly killed goat!!! Published by frgee on Friday, June 06, 2003 at 8:23 PM. someone told me before i left that they would rather go to africa, where the real mission territory is. i agreed that this wasn't real mission territory, after all, it's a Catholic country, right? boy was i wrong. i said a Mass for these boys today and they poor fellows couldn't even say the Our Father. not a single adult bothered to show up. i delivered the schedule myself on monday. the lady who is supposedly in charge of the local community was at the haitian market. 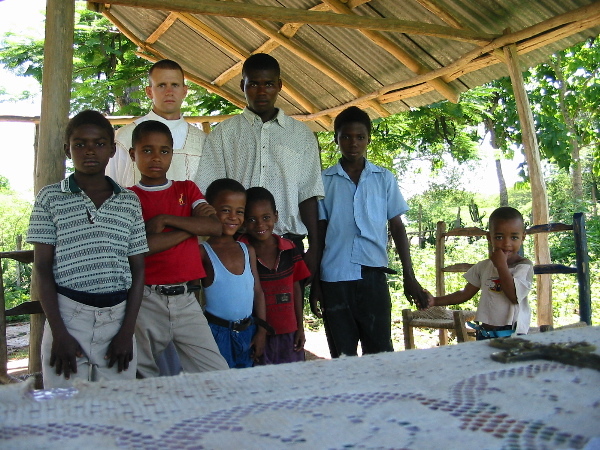 this might be a Catholic country, but half of these boys weren't even baptized - the task is daunting - 35 of these communities exist and i realize that the parish life of the bánica and pedro santana will be similar to that of the states: for instance, i had holy hour with confessions tonight. sung the o salutaris and tantum ergo by myself, but other than that, it's just like ola. however, the evangelization of these campos is going to require a massive outreach - i need some solid catholic lay people who can get out there everyday and really do some education. any volunteers? Published by frgee on Thursday, June 05, 2003 at 10:48 PM. Published by frgee on at 8:36 AM. Published by frgee on Wednesday, June 04, 2003 at 8:51 PM. Published by frgee on Tuesday, June 03, 2003 at 8:01 AM. maybe it's just me, but i think we sometimes have a certain intellectual prejudice or perhaps pride which comes from having degrees and education and it manifests itself in odd ways: for instance, our permanent deacon took the test for his high school diploma yesterday. an 18 year old that we're sending to get his drivers license so he can be a work for us is finishing 8th grade. i was giving a talk to the catechists yesterday on the Eucharist and i was going along nicely about the True Presence and the Echarist as the source and summit of Christian life, and i made a decision to plunge more deeply into the theology to see what would happen. so, i began to explain that no Mass can be separated from the Last Supper. id est, that our participation in Mass is also a participation in the Last Supper. the temporal engages in the eternal - when i first said it this 16 year old girl, who, in standard dominican fashion had large colored curlers in her hair (yes, ladies, they leave the curlers in! ), looked at me with an odd expression. i said, "you think i'm crazy?" "yes," she replied. "let me explain it this way," i returned. so i spent 15 minutes explaining time/eternity and the whole nine yards and at the end she said, "i get it." just that simply. i remember seminarians balking and griping after having heard this the first time, but she and the rest were transfixed the whole time. i've learned my lesson - the truth can be comprehended by anyone - that's the strength of Christ. Published by frgee on Sunday, June 01, 2003 at 9:30 AM. i met the young domincan priest who came to give a talk to our youth. he did a nice job as we all sat under a small ramada and discussed his theme of "analzying what people say about you" later, i took out the fly rod and made some casts. i am certain that this beach will hold fish given the correct tide and time of day - it was loaded with some nice grass, coral heads, crabs, and clams. i only had a few needlefish follow the clouser minnow i had tied on, but it was good to lay out some casts. the ride home was brutal - hot and loud. by the time we arrived home at 2000 hours my head was pounding, but by and large it was a nice day - it gave me some time to see these kids as they are when unencumbered by the restriction of adult society - they are different in one large way from their american counterparts - there is an intimacy of life which comes from humility that isn't always present in americans - there didn't seem to be any of the clickiness inherent in american teenage groups, they do, as mother used to always say "play nice together." they seem more like brothers and sisters than friends - it's an intersting dynamic that i need to continue to study.